risk of being stranded with excess generation supply due to overbuilding for forecast future need. Unfortunately, connecting the Yukon grid also comes with risks and costs. Namely, any transmission line would be expensive, significant upgrades to the existing Yukon system would likely be required, and trading partners must be willing to purchase at high prices and sell at low prices to generate financial benefits. The goal of the Transmission Logistics and Market Assessment papers was to determine the technical and economic attributes of developing a transmission line to another jurisdiction. The reports studied two potential transmission lines, one to Iskut, BC, and one to Fairbanks, Alaska. A third option connecting to Skagway, Alaska was already studied in a separate report as part of the Southeast Alaska Economic Corridor Viability Assessment. 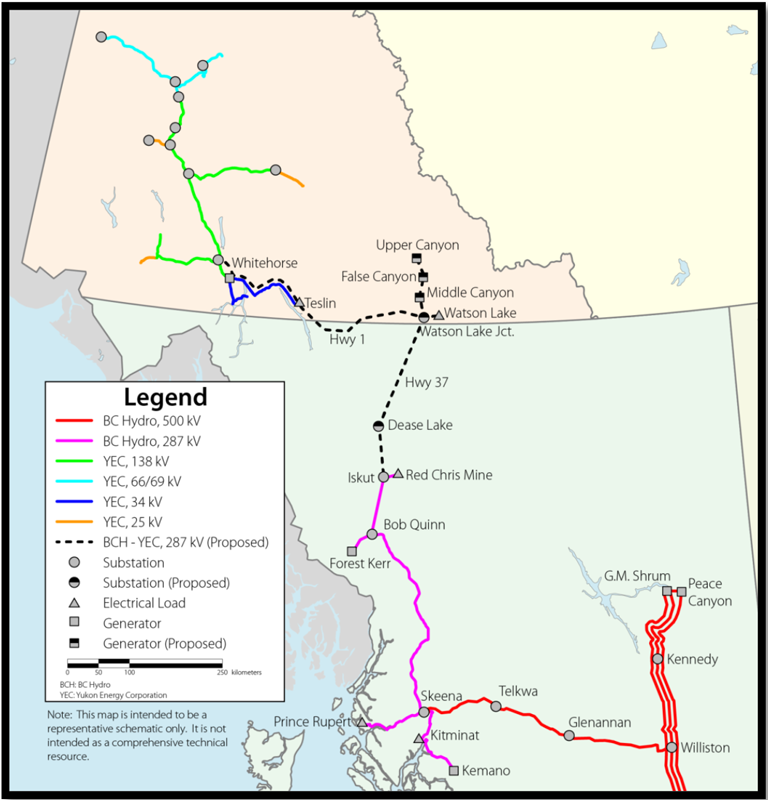 The transmission lines required to connect the Yukon to either BC or Alaska are very long and costly to build. In addition, due to the long length the transmission lines also have a relatively low carrying capacity, meaning they are not able to transfer a large amount of electricity. As a result of the high cost of interconnection and low transfer capacity the benefits of constructing must be large to justify the costs. Based on an analysis of the BC and Alaskan markets for electricity trade with the Yukon, the benefits from trade do not justify the cost of the transmission lines. Given the potential price at which we can import and export energy, the long transmission lines, relatively small Yukon demand, and low carrying capacity the transmission lines to either Alaska or BC are uneconomic. The table below shows the anticipated export revenue that would be possible given the technical limitations of the proposed transmission lines and the anticipated sale price of electricity and compares it to the cost of building transmission as well as new generation assets needed to produce the power that could be sold. To provide a sense of scale, the Yukon would need to export 227MW per hour, 24/7/365 for 60 years to defray the cost of the Iskut, BC transmission line (this would require 6 Whitehorse Rapids facilities to be in operation).